Mr. Flanagan was efficient, very competent and extremely professional. With Mr. Flanagan's help, we were able to reach a resolution of the issue that was favorable to our client. How do appraisals and valuations differ? 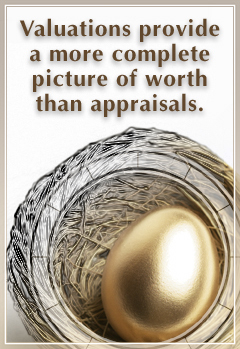 A valuation provides a more complete picture of market value than a simple appraisal. This is because an appraisal takes into account only tangible assets like equipment and buildings while a valuation includes the tangible assets as well as intangible assets such as operating systems, location, history, value of staff, scope of business and owner's reputation. As a buyer, the most important reason is to verify the "True Net" (net cash flow to the owner.) This will confirm if the existing business can provide both a reasonable salary and enough cash flow to pay off a business loan. Additionally, if a loan is needed, the lending institution will usually require documentation of market value. Why should Circumference be my valuation consultant? Privately owned small businesses and closely held lower and mid market business are each unique. Being unique, they present valuation issues that must be dealt with on an individual level. Being unique, they cannot be randomly compared to publicly traded companies. And being unique, they each come with their own set of risks and rewards. Circumference focuses only on small to lower middle market businesses. We work with the owner to value all the assets of the business and deliver a complete picture within the valuation report. Professional practices are more complex to value than ordinary businesses for three reasons. First, a significant amount of the practice value is derived from the reputation and abilities of the physician. Second, multiple factors separating one practice value from another include location, patient loyalty, referrals, facilities and the physician's work habits. Third, special problems are posed by dependency on one or a few key individuals and their contributions are an important factor in determining the value. Circumference knows what to review while understanding each practice has its own nuances. Circumference has extensive experience in the valuation of medical, chiropractic, dental, podiatric and allied health care practices. Our specialty is valuing practices earning between $50,000 and $5,000,000. Our experience in health care paired with expertise in practice finance and valuations gives us the advantage you need. Owners selling a business often have an over inflated value of what their business is worth. The old "Rule of Thumb" simply isn't the most accurate approach (See "The Problems with the Rule of Thumb" article on our Resources page.) Using a professionally prepared valuation can help prevent costly mistakes. Whether buying or selling a business, it is key to know if the intangible assets are over or under valued. Time and accuracy. Numerous factors influence business value.What financial information should a seller deliver? What financial information is most important to a buyer? How does the business compare to the industry? Do the facts show the income potential justifies the purchase price? You could spend hundreds of hours doing research just to figure out the relevance of the data, what to look for and what to ignore. What will I get if Circumference performs a Practice Valuation for me? Our clients receive a professionally prepared document that provides a detailed analysis of the business. The report will also explain our methodology and show the calculations we used to arrive at the range of value. Accountants, lawyers and bankers appreciate the detail and supporting documentation we provide. How long does it take to get a Practice Valuation? Circumference works jointly with our clients to collect the necessary information. Once the information is collected, the process proceeds quickly. The Letter Appraisal Report and the Professional Practice Valuation will take about three weeks to complete. The Comprehensive Valuation Report is more extensive and will take about six weeks to complete. If there are delays in obtaining information from the business owner, then the process takes longer. Progress reports allow clients to know the status of the valuation at any given time.